it was bright orange with a forceful blue graphic and lettering on the front. and short sleeves. a time in my life when i thought all would be mightily impressed by the paiste 2002 cymbal logo. obviously no-one would be wearing such an emblazoned garment were those bronze discs surrounding the drumset (which i happened not to have with me at the time) not of that ilk. would they? actually, just to be pedantic on my own behalf for a brief moment, most of my cymbals were either paiste 602 or sound creation, but the 15" hi-hats were definitely 2002. at least, they were until i replaced them with a pair of 14" 505 sound edge. the shirt itself was very much an example of 'pride bears no pain', for to be honest, the fit was never that great; the torso was just a smidgeon too short and after a few washes the orange lost a substantial portion of its consistency. but it was most definitely a paiste t-shirt, and one that had been sent gratis by toomas paiste himself from switzerland. faffing around in an art college was never a cool prospect, at least, not in the temperature stakes, so it was not uncommon to be dressed simply in jeans and t-shirt for the duration. it was, not to put too fine a point on it, pretty much the school uniform. that and long hair. the t-shirt has long gone, though most of the hair is still hanging around (literally), added to which, i no longer play paiste cymbals, but a rather delectable set of italian roto-cast ufip cymbals. and i don't have a t-shirt that proclaims that. in fact, i rarely wear t-shirts of any hue these days, at least not in a ny sort of brazen fashion. i'm not entirely sure that i find t-shirts sartorially appropriate in this present day; they seem somewhat at odds with my approaching seniority, so are generally confined to hiding under some sort of merino top layer. 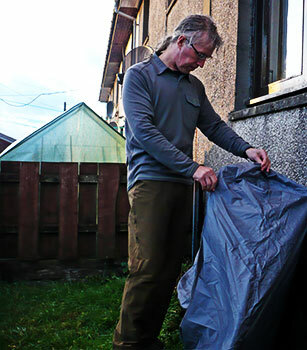 'clothes' they say, 'maketh the man', and though i'm probably making life very hard indeed for those clothes, the object of remaining comfortable never actually goes away, it simply modulates slightly with the passing years. there is also the mitigating factor that the weather on islay is rarely conducive to short-sleeving, if you'll pardon the slackening of my english. so the future may no longer be orange, but it does come with long sleeves. i think it far better these days, that i possess a modest level of sartorial elegance while remaining ensconced in my comfort zone, so i have, in recent years, adopted the collared polo shirt, preferably comprised of merino wool and cut just ideally for a spot of velocipedinal activity should it inadvertantly present itself. i think it shows that i care enough to look almost as good as the bicycles i ride; whether anyone else shares the same philosophy is a moot point. in fact, with the non-stop attention paid to our less than pelotonic cycling apparel needs by a number of imaginative clothing providers, it has become a simple matter of dressing appropriately each morning while covering all salient bases. nick hussey's vulpine clothing has been scurrying about, finding all the right boxes in which to place a tick. 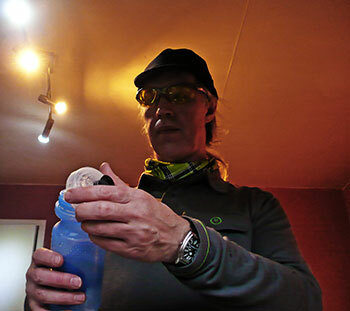 i have recently waxed lyrical with regard to their long-sleeved merino t-shirt which i quickly and meritoriously converted to a baselayer of warming propensity, a garment most suitable for wearing under either their acclaimed rainjacket or softshell. but as the colder winter months approach, a median layer of sorts ought perhaps to join it; perhaps a long-sleeve polo shirt for example. 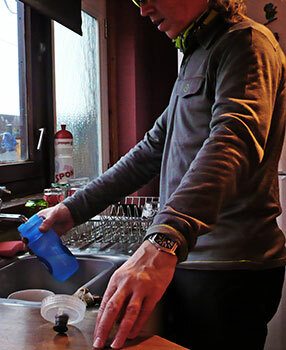 earlier this very same year, vulpine proffered a short-sleeve merino polo shirt, one that i readily admit, found favour in thewashingmachinepost cycle clothing wardrobe. it could be worn with either a short-sleeve t-shirt (just like that from paiste, but preferably of less imposing colour) or merino baselayer. if i had designs on looking like the fellow with whom i seem most often compared these days (sheldon, from the big bang theory), i could add a long-sleeve in a failed attempt to look co-ordinated. but aside from presentational properties, all were finely adapted for an itinerant life in the saddle. however, as i have been at pains to point out, long-sleeves rule ok. and as if to add weight to my contention, mr hussey has made available a long-sleeve merino polo shirt that is even more perfectly formed than its short-sleeve clubmate. 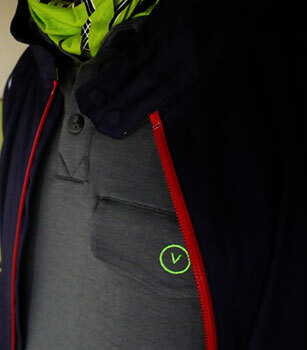 on the grey example that i wear even as i write, a flapped breast pocket features a lime-green encircled 'v' logo, matched by a similar item at bottom right on the rear of the shirt. both these are complemented by lime-green stitched cuffs and hem, both exhibiting a more than excellent length for sitting at the daily imac and stretching out on a scottish drop barred road bike. three buttons open or close the collar. yet again, in a manner that risks becoming the norm, i spent almost a week inhabiting business mode before committing to saddle. seamless would appear to be an appropriate description. how smooth is it nowadays that scuttering hither and thither with an air of fastness can be combined with almost anonymous froth supping capabilities? as i near the end of my hypothetical formula one contract with liquigas, and that pink jersey seems more remote than ever, the fact that a lime-green logo can keep me in touch with any erstwhile modest sporting aspirations i may have once harboured, yet all the while providing outward civility (if you know what i mean?) is of great comfort. and, in the context of sharing with others, i think it eminently likely that a vulpine long-sleeve merino polo shirt will fulfil a similar role for those of a similar disposition, irrespective of age. did i mention it has long-sleeves?